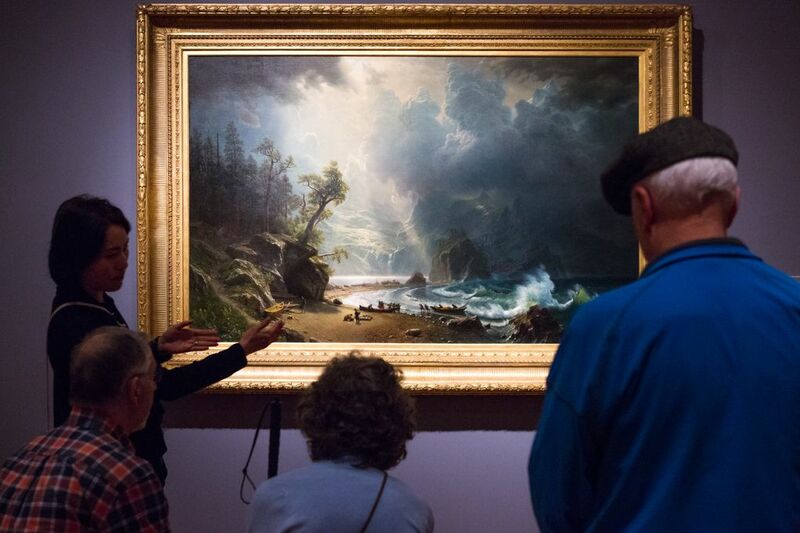 Once a month, Seattle Art Museum sponsors a tour geared to those with low or no vision. For the participants, the Art Beyond Sight program offers a unique chance to connect with art and find community. An art museum might seem an unlikely gathering place for people with low or no vision. “We are so lucky to have this. Art is hard to hear and it’s difficult to describe. But they make it come alive,” says Camille Jassny, 67, a regular participant. Jassny organizes a support group as well as a book group for those with blindness or low vision, and through the groups she has introduced several participants to the SAM program. Many people with vision impairments don’t know about activities like Art Beyond Sight, she said, and she has made it her mission to increase awareness. The next tour is of the “Andrew Wyeth: In Retrospect” exhibition, 1 to 3:30 p.m., Saturday, Nov. 18; Arnold Board Room of Seattle Art Museum, 1300 First Ave., Seattle; free with advance registration; www.seattleartmuseum.org. The program was started in 2008 by SAM docents as a partnership with the international collective Art Beyond Sight, which helped SAM develop its program and offered training. Since then, SAM has developed its own expertise. Program staff communicate with similar programs around the country and help other local institutions develop efforts of their own. Former SAM docent Donnie Wilburn, 72, lost her sight 10 years ago and has been involved in the Art Beyond Sight program at SAM from the beginning. For the past eight years, she has been an adviser to the museum’s Art Beyond Sight committee. “It’s been one of the most fun and rewarding things I’ve done, and it’s so rewarding to see it grow,” she said. On a recent Saturday, the Art Beyond Sight tour started with 30 minutes of socializing over coffee and pastries. It was a lively group and the mood was convivial, with old friends greeting each other and catching up. Several of the participants attended with sighted partners or family members assisting them. But just getting to the museum can be a challenge. “Uber has helped tremendously,” Wilburn said. Museum staff wait for the arrival of guests being dropped off so they can help them in, and they make sure everyone gets home safely afterward. “We have tried to eliminate barriers” that might prevent attendees from enjoying the museum “just like everybody else,” Wilburn said. Participants made their way onto an elevator and into the gallery using canes and guide dogs, assisted by museum escorts whose role is to help them get around safely. Gathered in small groups around a piece of art, participants looked intently toward the presenters as they described the artwork in detail. Their descriptions ranged from the pedestrian (dimensions, objects and colors) to the poetic (“Light is shining downward and reveals the softness of the cotton-candy cloud.”). Presenters also offered historic and artistic context for the works and answered questions from participants to fill in the gaps (“What color is the ocean?”). When an explanation painted a vivid picture or when a familiar reference offered insight into an image, attendees nodded in recognition. 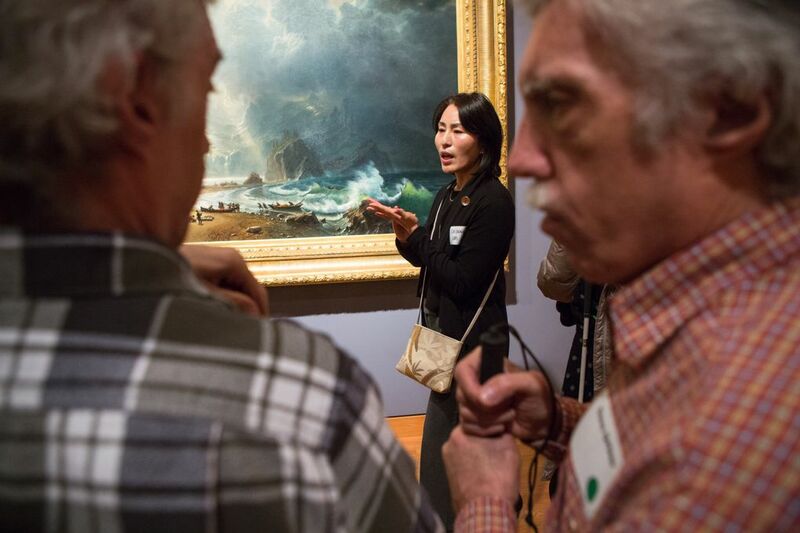 Both docents and the escorts who assist participants receive specialized and ongoing training. Learning how to engage their audience with the right kind of verbal description is key for presenters, and trainees sometimes practice listening to each other’s descriptions blindfolded. 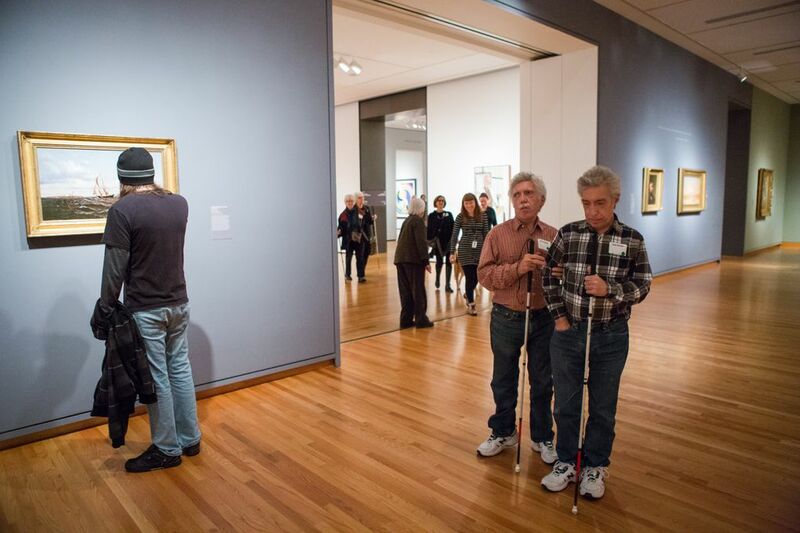 Dave and Dan Ortner, 60-year-old twins who lost their sight nine years ago from the same degenerative condition, have been taking part in the Art Beyond Sight tours for about three years. They discovered the program after joining a support group, Vision Loss Connections, organized by Jassny. Both have been involved in the arts — Dan as an actor and Dave as a writer of poetry and short stories — and they praised the work of the docents who lead the tours. 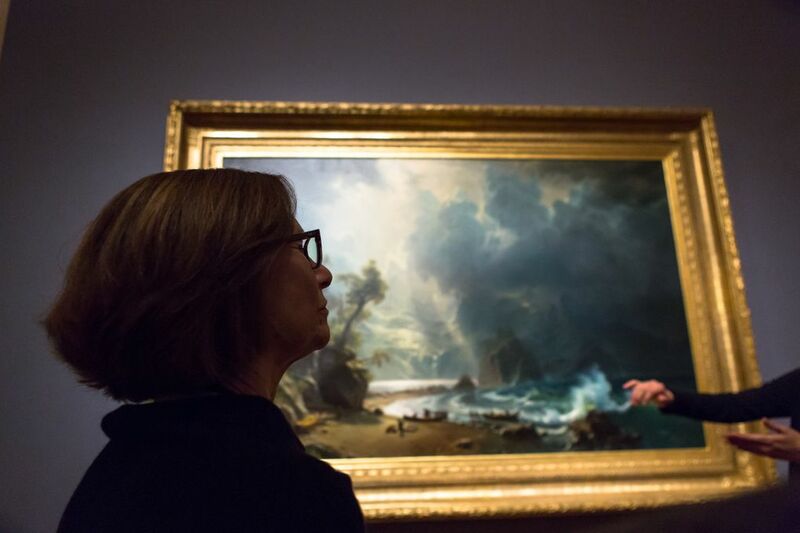 “They thoroughly explain the art and the background; the docents really do their homework. They describe the work really specifically and you really get an idea of what it is,” Dan Ortner said. For both brothers, 2015’s “Intimate Impressionism from the National Gallery of Art” exhibit was a highlight, especially because they were familiar with some of the works, having seen them before they lost their sight. They also enjoyed this year’s “Jacob Lawrence: The Migration Series” exhibit, a series of paintings about the history of African-American migration. “You got a really good idea of the whole series,” Dave Ortner said. One of Wilburn’s favorite Art Beyond Sight experiences was last year’s “Yves Saint Laurent: The Perfection of Style” exhibit. Participants were able to feel items of clothing and jewelry and even engage their sense of smell by sniffing perfume. “That was fun — so different,” Wilburn said. Tactile experiences are offered as part of many of the tours. 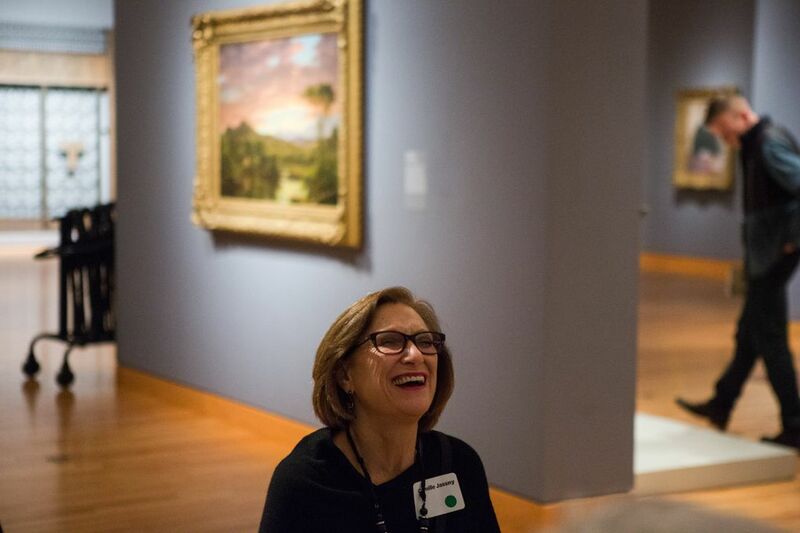 For Polly Amkraut, a volunteer docent who is also a social worker, working with Art Beyond Sight allows her to engage with a more intimate group and get to know the regular visitors. It also allows her a chance to give back. “We get to be their eyes,” she said. Jennifer Sokolowsky is a writer and editor. Learn more at jensoko.com.